Noise protection. We offer the widest selection of ear plugs and ear muffs of all kinds available anywhere, and our prices are some of the best you will find anywhere. Music in the workplace. With our high noise earphones, workers can enjoy listening to music while remaining protected from ambient noise as well as being protected from playing their tunes too loud. Look for our OSHA Compliant seal so you can buy with confidence. Face to face communications in high noise environments. From passive ear plugs with non-linear filters to electronic ear plugs and ear muffs, we help your communicate face to face in the loudest environments without having to remove your ear protectors. Industrial communications in high noise environments. We provide a wide range of two way headsets for use with your existing two-way radios, or with built-in two way capabilities. Bluetooth headsets. Our industrial quality bluetooth headsets let you make and take cellphone calls in high noise areas, comfortably and clearly. Custom molded ear plugs. We offer the widest assortment of custom ear protection products, including lab made custom ear plugs, custom ear plug systems (OCEPS) that let you make custom ear plugs for all the workers at each of your work sites. Industrial safety. We are growing and expanding into more industrial safety categories for your convenience. As we do, you can be confident that our normal excellent service, fast shipping, and great prices will always be available, no matter what products you buy from Ear Plug Superstore. Ear plugs are by far the most popular choice for ear and hearing protection, whether you're sleeping, biking, working, studying, or swimming. Ear plugs are economical, and we have tons of different kinds to choose from along with the info you need to help you pick - whether you're looking for one pair or thousands. We carry a large selection of ear muffs, both high tech electronic ear muffs and regular passive models. Ear muffs are ideal for hunting and shooting, and for high noise communications, but can be used for almost as many purposes as ear plugs. Learn more about your auditory environment with a noise dosimeter. These sound level meters tell you whether the noise levels around you are safe, or whether hearing protection is required. Most commonly used in industrial settings, you can use these noise level meters anywhere, from the public subway to your garage workshop at home. 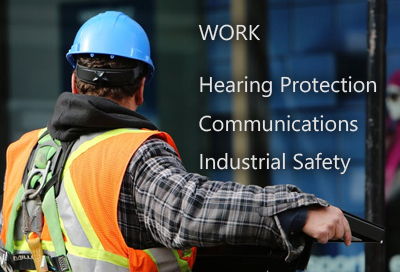 All of these workplace earphones, headsets, and ear muffs provide hearing protection for OSHA regulated workplaces in addition to music listening capabilities. Many also have a volume limiting feature that means your music stays at a safe, OSHA-approved volume that won't damage your hearing. Here you will find solutions for enabling communications in the noisiest of industrial workplaces, whether you need your workers to be able to communicate safely face-to-face or via 2-way radio. When you need to conduct group training sessions or group tours in noisy areas, we have just what you need: High noise headsets with built-in communications radios. Choose a group pack and adjust by adding more headsets to meet your exact requirements. If you want all members of the group to have two way capabilities, just choose the number of leader headsets or opt for a Peltor Two Way LiteCom headset. Industrial safety encompasses a huge category with products that protect every part of the human worker from workplace injury. While here at Ear Plug Superstore, we do not offer everything worker safety related, the products we do offer are made by the top producers in the world, and we provide them at excellent prices, with fast shipping, and knowledgeable friendly customer support. Come see what we have. More added all the time!